* A player called Kingsley Salami participated for the Nigeria U-20 national football team in the FIFA U-20 World Cup 2007 that took place in Canada. It can now be confirmed that this is the same player that has been starring for Bukola Babes FC during the Nigeria Premier League 2010-2011. Salami is born 27.02.1987 according to FIFA. Salami is apparently on the radar of Rangers International FC but I don’t know if any transfer has taken place. It is difficult to find information about the career of Salami but I know that he has played in Lebanon for the club Al-Hikma. * It is impossible to write about African football without making mistakes. My worst mistake to date is that I have previously written that Gideon Gambo of Sharks FC and the Nigeria U-20 national football team is a midfielder. Gambo is actually a goalkeeper and a dependable backup for first choice Okiemute Odah (born 23.11.1988). * Tony Edjomariegwe is arguably the player with the most difficult name in the Nigeria Premier League 2010-2011. Edjomariegwe has established himself at Crown FC and is a lanky and exciting attacker or attacking midfielder. The name of Edjomariegwe has been frequently misspelled in media reports and I have noticed that he uses the name “Tony Edjos” on his Facebook-profile. Edjomariegwe has scored one league goal for Crown FC so far this season and is a former player of Gabros International FC. * It can now be confirmed that Harrison Egbune, the highly gifted teenager who starred in his attacking midfield role for Crown FC at the start of the season, has joined Sunshine Stars FC. As far as I know, Egbune has yet to establish himself at the top club. Hélé Hélé has a lot of experience from Cameroonian football, basically for the club Espérance FC Guider. According to Fédération Camerounaise de Football, Hélé Hélé is born 01.10.1981. * Heartland FC has signed a new, promising striker from Gabros International FC called Obiagwu Ogochukwu, sometimes referred to as Obiegbu Ogochukwu. Ogochukwu has already shown promise and has been described as a lively striker. Ogochukwu is born 25.07.1990 according to the former webpage of Gabros International FC, now deleted. * I have previously written that the strong and hard-running Ghanaian striker Owusu Addai of Dolphins FC is born 16.03.1983. Since then I have concluded that this source is not trustworthy and I now believe that 04.02.1985, the date of birth he writes on his Facebook-profile, is correct. Addai has scored three league goals for Dolphins FC so far this season. * Victor Barnabas, presented in my post from 07.12.2010, has already established himself at his new club Enyimba FC and has so far scored four league goals in the blue shirt of the glamour club of Nigerian football. 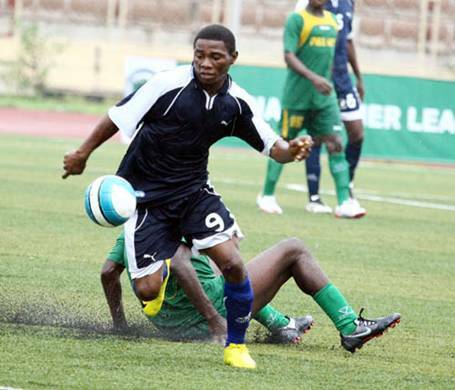 * Imenger Barnabas is one of the most promising teenage strikers in the Nigeria Premier League. The Kwara United FC hitman is a clinical finisher and already has three league goals to his name. He is described as a “highly skillful, hardworking and disciplined player”. His father, who carries the same name, is a former player for the Nigeria national football team. * In my report “Players with full international matches for Nigeria” from 02.03.2011, one player was forgotten. Emma Godwin, the tough central defender of Dolphins FC, played for the Nigeria national football team on 30.05.2003 against Ghana. Thanks to a reader from Poland for pointing this out to me. Godwin is the captain of the team and a defensive marshal. He has actually been with Dolphins since 1999. Godwin is born 11.11.1982 according to most sources, although I have also read the date of birth 23.06.1980. * Kabiru Sanusi and Christopher Chigozie are arguably the two form players in Nigeria. Sanusi has continued his amazing scoring spree and the star striker of Kwara United FC has now scored seven goals in the last eight matches. Chigozie is a red hot attacking midfielder of Ocean Boys FC and has scored five goals in the last four matches, in all seven goals during the season. * Abiodun Akande (born 10.12.1992) will most likely be one of the goalkeepers when the Nigeria U-20 national football team participates in the Orange African Youth Championship 2011. Akande has been a substitute goalkeeper for Shooting Stars FC all season but has played the last two matches for his team. * Dayo Ojo, a striker for Sunshine Stars FC, is one of the players I am most eager to find information about. Ojo has gotten rave reviews lately, but still has only one league goal to his name. The picture is of Ojo and is taken from MTN Football. Thanks for these,my name is BASH from Sango Otta Ogun State Nigeria and i have offer from Europe and they require players from nigeria premier league with their CV and full match videos for trial.